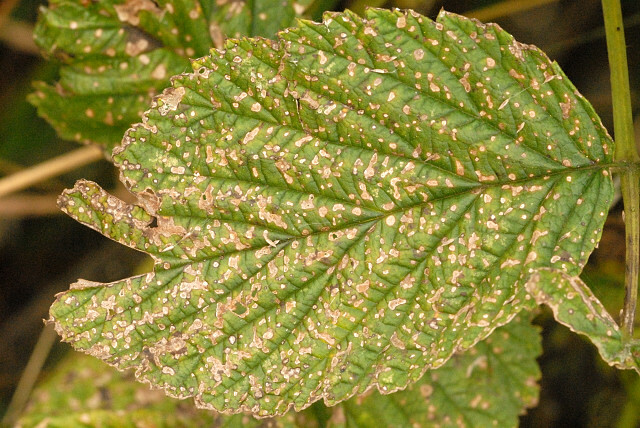 Elsinoe veneta on raspberry leaf, copyright James Lindsey. The Myriangiales are a group of mostly plant-pathogenic fungi, characterised by the development of a single ascus in each chamber of a well-developed, often gelatinous stroma. [EB03] Eriksson, O. E., H. O. Barah, R. S. Currah, K. Hansen, C. P. Kurtzman, G. Rambold & T. Laessøe (eds.) 2003. Outline of Ascomycota—2003. Myconet 9: 1–89. [PA-W02] Pang, K.-L., M. A. Abdel-Wahab, S. Sivichai, H. M. El-Sharouney & E. B. G. Jones. 2002. Jahnulales (Dothideomycetes, Ascomycota): a new order of lignicolous freshwater ascomycetes. Mycological Research 106 (9): 1031–1042.